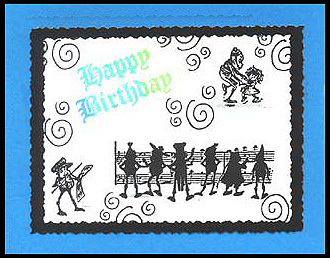 “Dancing – Music Conductor”, “Dancing – Reading Music” and “Dancin”” are stamped with Graphite Black Brilliance ink while “Happy Birthday” is stamped with Peacock Brilliance ink on white Bristol plate card stock layered on black glossy and teal card stock. Swirls are part of “Swirls Background”. Card by Margaret Wiggin.